With a name like New Style, Old Fashioned, it is the perfect cocktail to celebrate the beginning of a new year, and the giant ice cube within the drink is almost like a snowball, so perfect for winter! 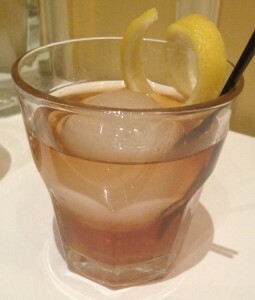 The New Style, Old Fashioned at the Left Bank (we enjoyed ours at the Santana Row location) is a wintery take on a regular old fashioned, consisting of rye bourbon, dark amber maple syrup and Peychaud’s Bitters, plus a lemon twist. It’s a complex mix that brings together bitter, sweet and sour, so definitely a wake-up for your palate and a good pre-dinner drink. The combination is pretty intense, but great if you like old fashioneds and even better if you appreciate innovative ice. I happen to appreciate a creative ice cube and think bourbon is at its best watered down, so its a good option for me to consider if I’m in the mood for whiskey. If you are looking for a cocktail that is sophisticated, strong, but with a bit of sweetness, go with the New Style, you’ll appreciate the Old Fashioned.